CONTACT US TO GET OUR EXCLUSIVE PRICES & OFFERS! Aldemar Cretan Village Beach Resort, consisting of comfortable two-story buildings in the colors of Cretan architecture and located next to the sea, with amidst blooming gardens and intoxicating odors. 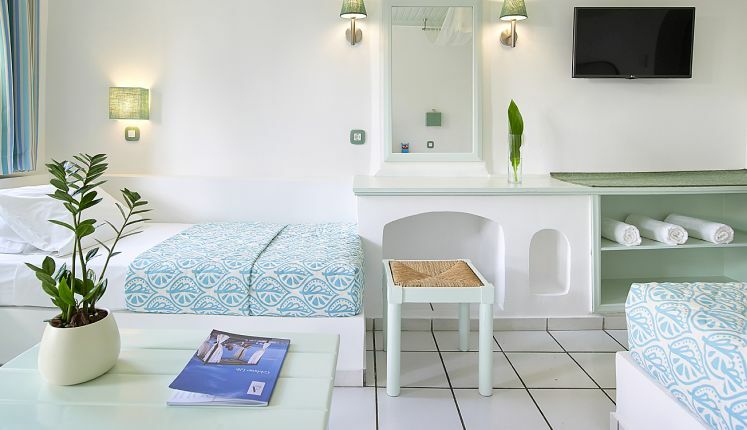 This Cretan beachfront hotel is an ideal place for a carefree family holiday. Here you can relax, enjoy the beautiful panorama and give your children the opportunity to plunge into the summer fairy tale in Crete island! Aldemar Cretan Village is located 23 km from the International Heraklion Airport, and 2 km from Hersonissos. The bus stop is in front of the hotel. Evening entertainment: Hersonissos (2 km). Both sandy and pebbly beach, with an open coastal strip, is equipped with everything necessary for a comfortable rest. The entrance to the sea is both sandy and pebbly (a few meters from the shore is a natural stone slab). Sunbeds, umbrellas, and towels are provided free of charge (towels are changed near the central pool). Panorama: International alcoholic drinks, long drinks, cocktails, wine, beer, brandy, ouzo, raki, soft drinks, concentrated juices, hot beverages (champagne at extra charge). Veranda: Veranda, the main restaurant, is famous for its Cretan specialties and show-cooking. Continental Breakfast: 07:00-07:30. American-style buffet:07:30-10:00. Early Breakfast Service: upon request. Lunch : 12:30 – 14:30. Dinner: 18:30 – 21:00. La Pergola: La Pergola Taverna is a fabulous evening venue with live music accompanying heaven-sent food. Dinner : 19:00 – 21:00. Dionyssos: A nice corner for friends and families to relax and eat a choice of seasonal dishes where is offered at Snack Restaurant “Dionyssos”. Late breakfast: 10:00 – 11:15. Lunch: 12:30 – 15:30. Bistro: 22:00 – 23:00. Thalassa: The seaside Thalassa Restaurant offers delightful seafood and Mediterranean cuisine. Private Airport Transfers & Chauffeured Services are provided to our travelers with our exclusive Mercedes-Benz black-car vehicles & stylish concierge-drivers. Our Deluxe Business & Leisure Transportation Services in Crete Island are fully personalized to our clients' needs. Private Customized Tours & Guided Excursions are offered to our travelers who wish to live Greece Authentic Experiences. Our travel experts will assist you in personalizing your dreams! Lifestyle Concierge Management is available for our travelers who wish to experience their Greek Holidays with comfort, style, and the finest travel services! 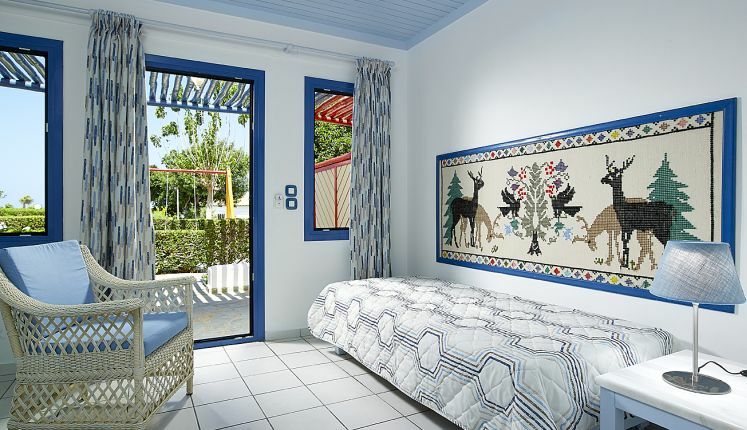 All bungalows have a garden view and feature a double bed or twin beds. Include a marble bathroom with bathtube, hair dryer, a magnifying mirror, satellite TV with music channels, direct dial telephone, refrigerator, safe deposit box (upon request / at extra charge), Free Wi-Fi Internet access and a furnished balcony or veranda. 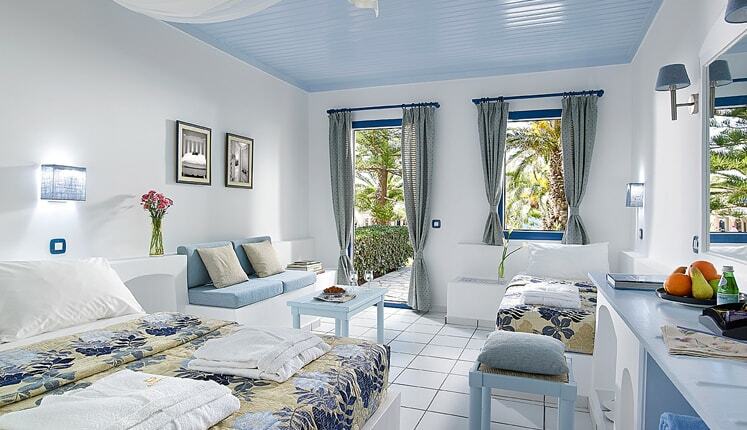 All bungalows have a sea view and feature a double bed or two twin beds. Include a marble bathroom with bathtube, hair dryer, a magnifying mirror, satellite TV with music channels, direct dial telephone, refrigerator, safe deposit box (upon request / at extra charge), Free WIFI Internet access and a furnished balcony or veranda. 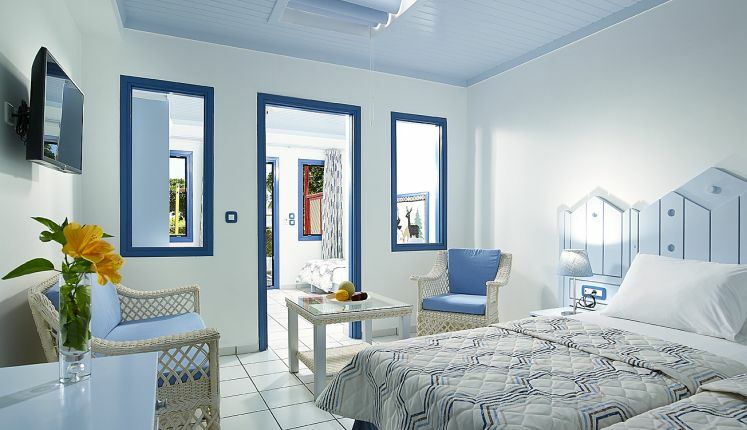 All family rooms have a sea view and feature a double bed or two twin beds and two sofa beds as well. Include a marble bathroom with bathtub, hair dryer, a magnifying mirror, satellite TV with music channels, direct dial telephone, refrigerator, safe deposit box (upon request / at extra charge), Free WIFI Internet access and a furnished balcony or veranda. All family rooms have a garden view and feature a double bed or two twin beds and two sofa beds as well. Include a marble bathroom with bathtub, hair dryer, a magnifying mirror, satellite TV with music channels, direct dial telephone, refrigerator, safe deposit box (upon request / at extra charge), Free WIFI Internet access and a furnished balcony or veranda. 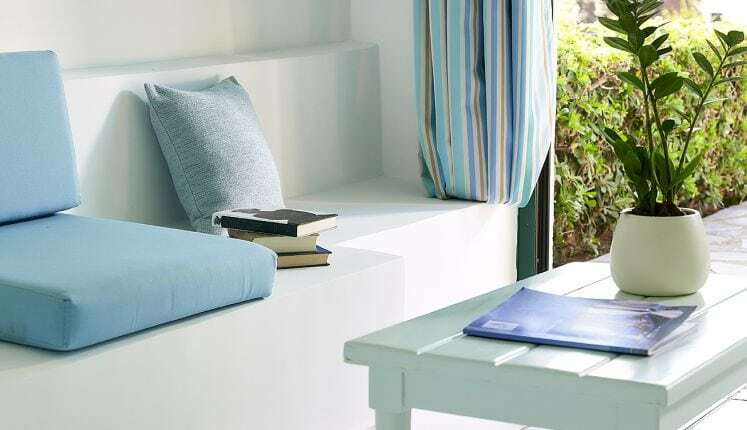 Family apartments have a sea view and feature one bedroom, one bedroom-sitting room with two twin sofa beds separated by connecting door. Include a marble bathroom with bathtub, hair dryer, a magnifying mirror, satellite TV with music channels, direct dial telephone, refrigerator, cooking facilities for babies upon request, safe deposit box (upon request / at extra charge), Free WIFI Internet access and a furnished balcony or veranda.